I like the closing shot of Terry and Arthur as they are runnning away from the Winchester, they turn to each other with a big grin on their faces. It left me with a warm fuzzy feeling at the time, because if I remember rightly in the supposedly last ever episode their relationship wasn't that great. Yep I agree - it is a great scene - like two old buddies on the run. 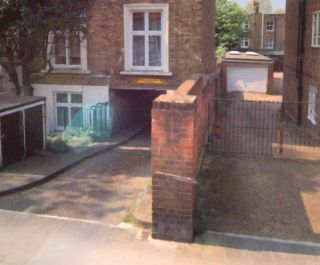 Interestingly (I only found this out by complete accident), the alley way they run up at the end runs parallel on the other side of the wall to where Terry chases the two thugs at the end of series 1's "Come in T-64, Your Time Is Ticking Away" on Clarendon Road opposite Lansdowne Rise, W11. Here is the Google Street View link: goo.gl/maps/ZY539 and the same with a better angle on: Bing Streetside link from which the last pic is taken. "How's tricks Arthur?" "I've no idea Tic Tac I'm an entrepreneur not a member of the magic circle"
......and Chisholm is very,very good in this. His body language on the train is perfect for someone that feels totally out of place and uncomfortable with the company he's in. "I do not intend to relax! I do not intend to have a good time and if you poke me like that again,so help me i'll stick one right in your boatrace!" "..and what is standard Interpol procedure in these circumstances? Another three coure meal I shouldn't wonder." See that the Arthur Daley doppelgänger gangster idea was shamefully stolen by Only Fools for their Xmas special Miami Twice. However Arthur did say "He who dares, wins" in the episode The Son Also Rises. I always watch this and the much maligned Officer and a Car Salesman at Easter or Bank Holidays if I have the time; I watched Orient Express on Easter Monday. And Linda Hayden's hair is fantastic! I agree entirely that watching this over a holiday period is just fantastic. I am not quite sure where Ray Winstone fits in into it though unless parts of this have been mistaken for 'Goodbye Sailor'. There's a Christmas Special, 'An Officer and a Carsalesman' and another special which is basically a montage of clips from all the series, 'The Early Years'. In the second 'special', Terry, Arthur and Dave are in the Winchester reminiscing and the different scenes appear as flashbacks. Never easy to stretch a TV show into movie length, but this is pretty good. Terry, Arthur and Chisholm are pretty much themselves - it is just the other regulars who are absent of course and replaced by a cast of characters on the train. It seemed to me like George hammed it up a little bit more for this one. Maybe because it was a special feature length episode. Although, he was actually hammered in the movie! We (me and the wife)ed it tonight and loved it! Very funny with the chemistry between Dennis and George at an all time high. One thing that was a bit odd though. Right at the start when the guy goes into the daughters bedroom. It looked very creepy. At one point my wife said "what the hell is he doing?' Of course it being Minder it was all innocent enough but still...did look suspect. Anyway, great episode ! From The Express on Wednesday 21st May 1986 - first ever release of this film on glorious VHS. Anyone know why this film is shown so rarely? After all, ITV4 have flogged The Professionals to death and beyond in recent years, closely followed by Minder itself and The Sweeny. Whilst we all love this programmes, it surprises me that ITV have not filled up a couple of episodes worth of the above with the film a bit more frequently. Would it be down to cost? Anyone know? I think it all comes down to the running time. The same applies to 'An Officer & A Car Salesman'. As they are over an hour in length fitting them into a (likely computer generated) schedule of 1 hour blocks means it just a non-starter. This would be my guess. I reached this episode/film with my viewing last week, really enjoyed it, I can see why it's not on TV so much what with its length, but you would think it would fit in well with a bank holiday weekend, when they seem to fill the schedules with back to back old movies. Why? 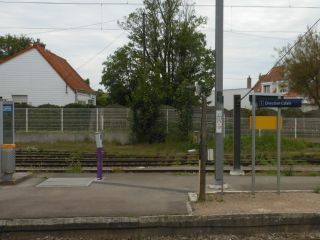 Well for me, this episode was shown at what was arguably the peak of the show's popularity - this station which features in the film's climax is literally in the middle of nowhere in France and when you're there you absolutely feel (well sad ol' me did anyway) totally a part of this total Minder momentum. Arthurs cream coloured trilby does really not go with his suit and of course crombie at all! 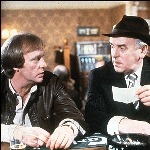 Arthur thought that the German guy in Minder on the Orient Express was Welsh. My health problems were acting up a bit today so I prescribed myself a dose of Minder. This turned out to be very good medicine! I enjoyed it a great deal. Nice to see Garfield Morgan in Minder. A great cast of familiar faces, even to my American eyes, playing interesting characters. So many great lines even by the standards of Minder. Patrick Malahide excels at playing Chisholm as a fish out of water. Nothing goes right for the poor guy! Dennis and George are definetly at the top of their game. I love the scene in the park at the end of part one. George Cole is really working his magic in that scene! If I didn't know differently and if not for the title cards indicating ends of parts, it would be easy to think this was a theatrical film rather than being made for tv. What where the ratings like for this when it first aired? It was originally intended for cinema release from what I remember. It certainly has the look and feel of a theatrical film. Since it aired on Christmas Day I was curious about the ratings. Here in Ameirica the major networks show reruns or an older movie they wouldn't normally show. Brand new programming is virtually unheard of in Primetime on Christmas evening. Loved it - never seen it before. The characters are that well-defined by now they work in a completely different setting such as this. The music's a bit cheesy, but it's prime Minder. Arthur's inhuman howl when he sees Chisholm for the first time ('Albert' again - Charlie has to be an alliterative nickname), the slinky Honor Blackman, Arthur outside the window, the slapstick fight at the end and the mention of 'Chisophrenia'...great stuff. I first saw this in August and I'm very tempted to give it another look on Christmas or as close as I can get. Agreed, this is must see Christmas viewing. When I spoke to Meic Povey about this one I felt a little sorry that only Chisholm gets to go to France and he was left at home with a few lines. I think it's almost impossible not to like this - arguably the script isn't the best ever Minder but the superb scenery, the train and the array of dodgy geezer characters just take you on a very enjoyable journey from start to finish. Top dollar Minder this. Below is a Press Photograph (which I obtained on eBay). Written below, the words which can be found on the back of the above Press Photo. 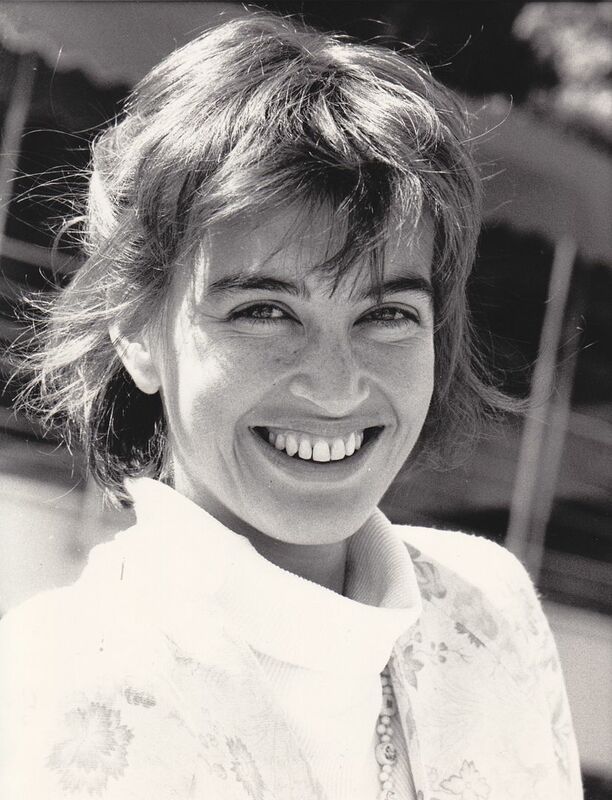 Actress Amanda Pays, who co-stars with Dennis Waterman and George Cole in the first 'Minder' movie, Minder On The Orient Express.